﻿Although I'm a cubicle dweller by day, I dream of owning my own business. One of these days I'll get around to developing a business plan for Roxanne's vegetarian cafe (I've actually given this a lot of thought - I just need to find someone with cash money to invest in my idea). But until I do, I can live vicariously through others. I think most people who work in an office have dreams of doing something else. I don't think anyone says "I want to stare at a computer all day" when they're growing up. But few of us have the cajones to actually try and make those dreams a reality. Except my former manager, Tom Moore. When I worked for him years ago in cubicle land, he talked about opening a bar. ﻿Sure he knew a lot about bars. I mean no disrespect when I say this, but he frequented enough of them to know what worked and what didn't. He had plenty of idea about what could make a bar profitable. But...it seemed like most other cubicle pipe dreams. Until he was RIF'ed. Unless you, yourself work in a cubicle, you may not be familiar with a RIF or reduction in force AKA layoff. My manager and I were in a department that was RIF'ed. I was days away from signing my severance paperwork when I found another job within the company. (it ended up being the worst job I've ever had and led to one of the worst year of my life, but...a girl's gotta earn money somehow) He was not so lucky. After working for the company for almost as long as I'd been alive at that point, he was let go. Granted, his severance package lasted him a good long time and he got to have an amazing summer doing all the things he'd missed out on while he was working 12 hour days. Golf, spending time with his family, enjoying time at his lakeside condo. (I've never met anyone who enjoys Lake Erie more than this man) But all good things must come to an end and he went back to work in the corporate world for a few years once his severance ran out. I lost track of him at that point, but recently decided to shoot him an email to see what he's up to. Much to my surprise, he'd bought a bar with a few business partners. And not just any bar, a lakeside bar. I spent a really nice night on the patio with my boyfriend, chatting it up with Tom and a few of his business partners. It was really great to see him so...happy. He's living his dream. As he said, he works really long days but enjoys every minute of it. How many of us get to wake up every morning and say that we're doing something we truly love for a living? To learn more about Sunset Harbor Bar and Grille, check out their facebook page.﻿ (their web site is under development). They're open 7 days a week and feature live entertainment on weekends. 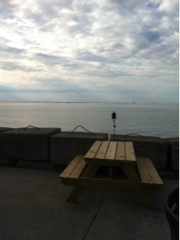 I dare you to find a nicer place in Cleveland to check out the lake and grab a drink or 5. Trust me on this. I never thought I'd like anything in Fairport Harbor, either.